Frances’ life combines aspects of secular and religious life. 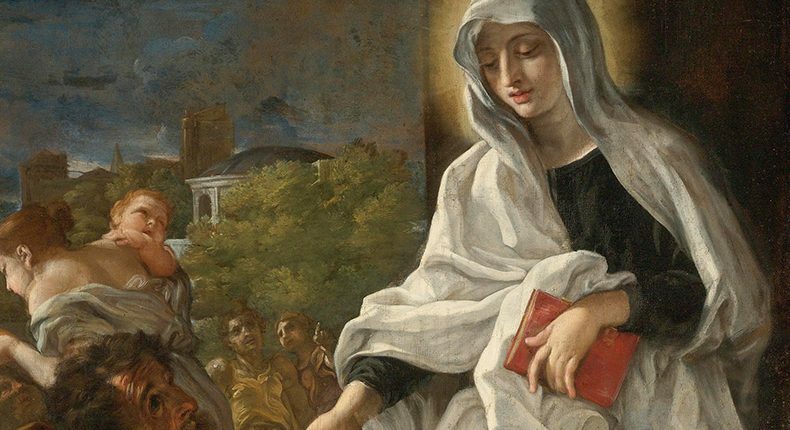 A devoted and loving wife, she longed for a lifestyle of prayer and service, so she organised a group of women to minister to the needs of Rome’s poor. Born of wealthy parents, Frances found herself attracted to the religious life during her youth, but her parents objected and a young nobleman was selected to be her husband. As she became acquainted with her new relatives, Frances soon discovered that the wife of her husband’s brother also wished to live a life of service and prayer. So the two, Frances and Vannozza, set out together—with their husbands’ blessings—to help the poor. Frances fell ill for a time, but this apparently only deepened her commitment to the suffering people she met. The years passed and Frances gave birth to two sons and a daughter. With the new responsibilities of family life, the young mother turned her attention more to the needs of her own household. The family flourished under Frances’ care, but within a few years a great plague began to sweep across Italy. It struck Rome with devastating cruelty and left Frances’ second son dead. In an effort to help alleviate some of the suffering, Frances used all her money and sold her possessions to buy whatever the sick might possibly need. When all the resources had been exhausted, Frances and Vannozza went door to door begging. Later, Frances’ daughter died, and the saint opened a section of her house as a hospital. Frances became more and more convinced that this way of life was so necessary for the world and it was not long before she requested and was given permission to found a society of women bound by no vows. They simply offered themselves to God and to the service of the poor. Once the society was established, Frances chose not to live at the community residence, but rather at home with her husband. She did this for seven years, until her husband passed away, and then came to live the remainder of her life with the society—serving the poorest of the poor. Looking at the exemplary life of fidelity to God and devotion to her fellow human beings which Frances of Rome was blessed to lead; one cannot help but be reminded of Saint Teresa of Calcutta, who loved Jesus Christ in prayer and also in the poor. The life of Frances of Rome calls each of us not only to look deeply for God in prayer, but also to carry our devotion to Jesus living in the suffering of our world. Frances shows us that this life need not be restricted to those bound by vows.